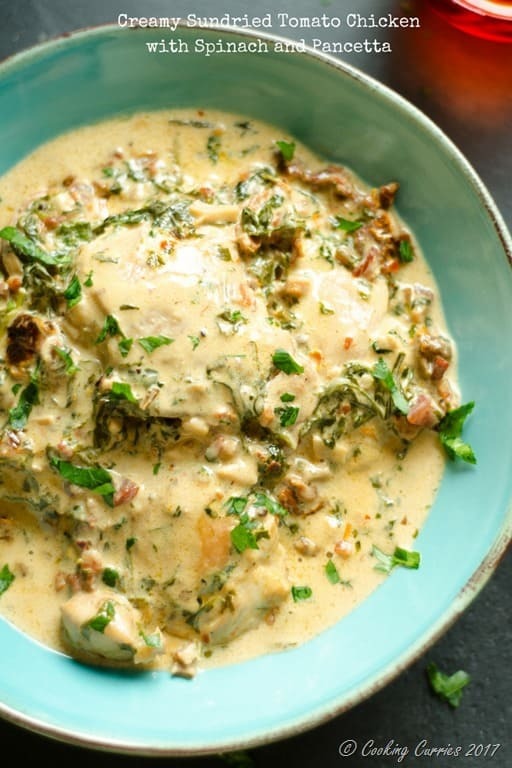 Chicken cooked with sun-dried tomatoes, spinach and pancetta in a creamy sauce to make this delicious one-pot weekday meal is definitely going on your favorite recipe list as soon as you make this! 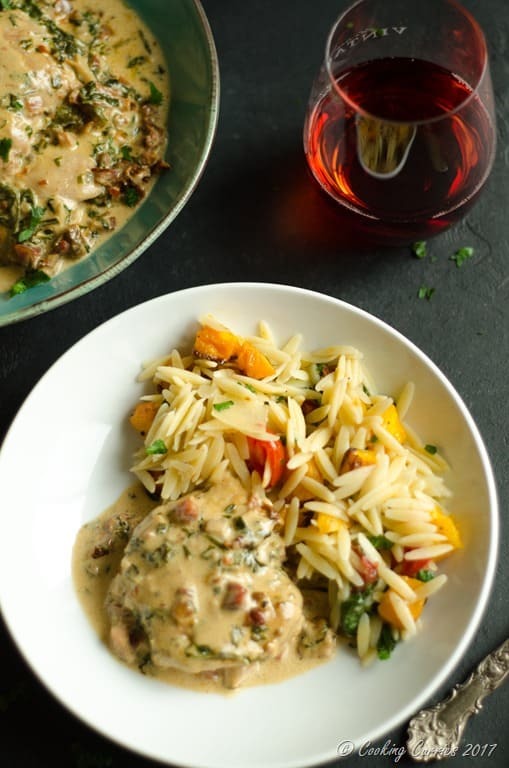 So, if you search the interwebs for Creamy Tuscan Chicken you would come across something similar. I always called this sun dried tomato chicken and once I saw the Tuscan Chicken pictures and recipes everywhere, and it looked very similar to this, I thought, yay! this recipe has an official name to it! But then I wanted to know why it made the Tuscan Chicken recipe Tuscan and did some research. When I read up about Tuscan cuisine, there wasn’t anything much about sun dried tomatoes in it and certainly not any creamy chicken recipes. Tuscan cuisine is all about simplicity (the concept of “poor cooking”) and there is a lot of bread, cheese, legumes (cannellini beans) and fresh vegetables. 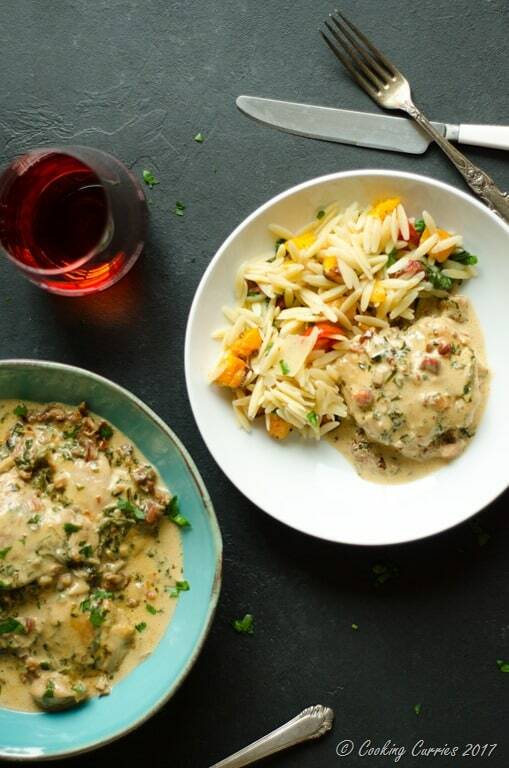 Then I read somewhere about a copycat recipe of Olive Garden’s Creamy Tuscan Chicken recipe and I think that is where this concept of a creamy Tuscan chicken evolved. 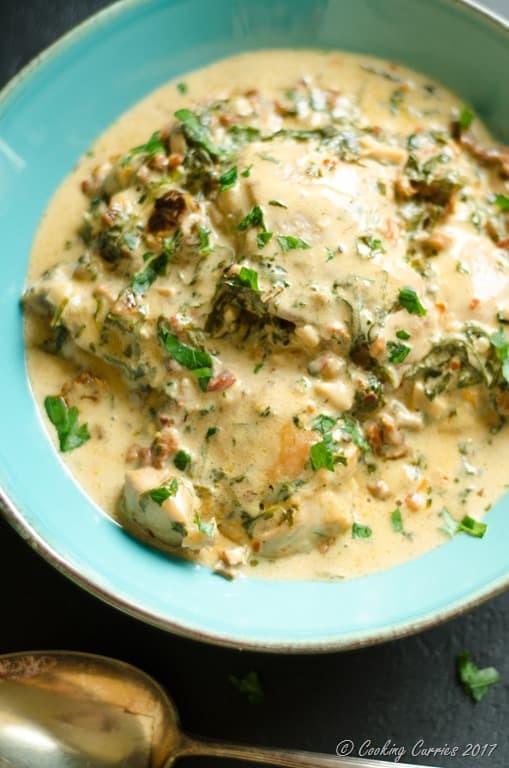 So unless I have more evidence in research (feel free to correct me if you find any more information, post them in the comments) I will continue calling this recipe of mine, Creamy Sun-dried Tomato Chicken with Spinach and Pancetta. The first time I made this recipe, I was putting together a bunch of things that will go well with chicken for a one pot kinda recipe and I had some pancetta cubes in the refrigerator that needed to be used. AJ loved those and in they went every time I made this! Heat the oil in a shallow pan and add the chicken thighs in a single layer. Season with salt and pepper. Brown the chicken on both sides - about 3-4 mins on each side, on medium high heat. Remove chicken from pan and keep aside. Add the pancetta cubes to the hot oil along with the garlic. As the pancetta crisps up and browns, add the sun-dried tomatoes and the chopped baby spinach. Season with just a little salt and pepper. Pancetta is salty in itself, so we dont need a whole lot of salt. Bring the chicken back to the pan and add the whole milk and heavy cream. Cover and cook on low heat for about 8-10 mins, till the chicken cooks through and absorbs some of the flavors in the sauce. Add the red chili flakes and mix it in. Serve as it is or over pasta.